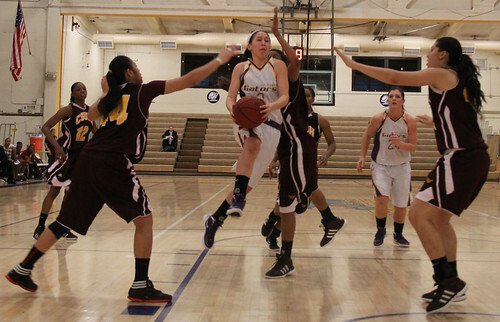 Angela Van Sickel drives down the center of the key against Dominguez Hills defenders in the SF State Gym Feb. 22. The Gators won the game with a final score of 39-35. Photo by Mihail Matikov. The SF State women’s basketball team managed to steal a victory from Cal State Dominguez Hills, 39-35, despite shooting 25 percent in the California Collegiate Athletic Association home game. The win breaks the team’s five-game losing streak and improves SF State’s record to 8-19, going 7-14 in CCAA so far. Yet, even with the win, the Gators cannot make the CCAA conference tournament, which is scheduled to begin Feb. 28. Both teams struggled early, scoring just four combined points in the first four minutes of the game, missing the first nine shots before the Toros’ Sherrie Hughes scored on a layup. The Gators first scored when freshman Farrah Shokoor hit a free throw with 15 minutes remaining in the half. Wallace’s frustrations were evident early, taking out his entire starting lineup in the first 15 minutes. After two more failed offensive possessions, junior Lyneeka Boyd grabbed an offensive rebound. After getting fouled she hit both free throws, making it 4-3 Toros. The Gator offense struggled partly due to the absence of junior point guard Charnay Bell, who didn’t play for undisclosed reasons. Sophomore Sherika Miller made a layup for the Gators’ first field goal, nearly eight minutes into the game. Coach Wallace continued to sub players in until junior Nicole Hicks managed to connect on the team’s second field goal, a jumper with 10 minutes left to give them a 7-6 lead that they would expand to 13-6. SF State maintained the lead until the second half, leading the Toros 19-18 at halftime. With the game seemingly a toss up, both sides seemed eager to capitalize on the other’s mistakes in hopes of stealing a late-season win. Into the second half, both teams again struggled to score, combining for just five points in the first five minutes of the half. Though they played solid defense, the Toros’ head coach Van Girard questioned each team’s effort levels as both squads have already been eliminated from the CCAA’s conference tournament. The Toros had more turnovers than points, accumulating 36 turnovers against just 35 points for the entire game. The victory was a team effort for SF State as Booker led the team with only eight points. She also led the team with five steals; part of the team’s season-high 19 steals. The Gators round out their season Friday, Feb. 24 against CCAA rivals Cal State LA in another home game.